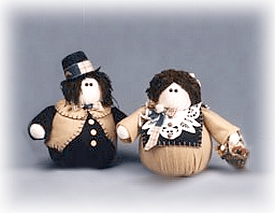 Wouldn’t these roly poly styrofoam ball pilgrims look wonderful in your home for Thanksgiving? Felt: tan, 1 yd. ; antique white, 1-1/3 yd. ; black, 1 yd. 2. To “dress” the lady pilgrim, center 6″ ball, round side down, on 15″ square of tan felt; tightly gather felt around ball. Use a knife or scissors to poke tightly gathered felt into the flat side of ball; glue to secure. Repeat step for the gentleman pilgrim using a 15″ square of black felt. 3. Cut a 1/2″ slice from each 3″ ball. Center 3″ ball, round side down, on 10″ square of antique white felt; gather felt tightly around flat side of ball, smoothing out as many folds as possible; tightly wire together the gathered edges with the 26-guage wire. Cut excess felt to 1″ long. Fold the gathers back and glue to ball. Insert and glue one end of a 4″ length of 16-gauge wire into the head. Insert the other end in large tan ball and glue balls together. Repeat for the gentleman pilgrim, using the 6″ black ball. 4. To make the hands, glue two 1 1/2″ balls onto the ends of an 18″ length of 16-gauge wire. Gather a 6″ square of antique white felt around one ball; tightly wrap wire around gathers. Repeat for other hands. 5. To make the sleeves, glue together the long edges on a 6″ x 12″ strip of tan felt, making a 12″ long tube. When dry, turn right side out and slip the arms into the tube. Attach to the lady pilgrim behind the head and neck with a U-pin made of 16-gauge wire. Glue to secure. Repeat for gentleman pilgrim, using black felt for the sleeves. 6. Using pattern A, cut vest from tan felt. Blanket stitch around edges where shown using black thread (optional). Stitch a gathering stitch around the neck line, put vest on body, and pull thread tightly. Stitch the sides together at the neck; knot thread and cut off excess thread. Cut a 1 1/2″ x 13″ strip of tan felt for the collar. Blanket stitch along one long edge and both ends (optional); run a gathering stitch along the remaining long edge. Put the collar around the neck and stitch the sides together in front, matching the collar to the vest front. Cut off excess thread. Glue collar if necessary. Glue three tan buttons onto body. 7. Tie a 3″ bow from a 1″ x 12″ strip of torn fabric. Cut off the tails and glue bow to the neck of the gentleman pilgrim. Cut a small square from one tail and glue it to the vest for a patch. Glue a 1″ strip of torn fabric around the hat for a band. 8. Glue eyes to the face as show, just above the center of the face and close together. Blush the cheeks. 9. Wrap approximately 1/3 of the doll’s hair around a 5″ diameter object. Cut the hair into two equal halves. Tie each in the center with a double thickness of hair. Glue one skein to the front of the head and the other to the top back of the head. Finger comb the hair around the head and trim as needed. Securely glue the hat onto the head. 10. Cut out a 5″ x 8″ piece of black felt; cut as shown in Diagram 2. Blanket stitch around outside with tan pearl cotton thread (optional). Place on pilgrim with flaps in the back. Cut the doily as shown in Diagram 2 and slip on over the black felt. Glue where needed. Make a bow with 4″ tails from a 1″ x 18″ length of torn fabric; glue to one side of neck and glue a rose to the center. Glue three mauve buttons down the front of the doily. 11. Wrap the remaining doll hair around a 6″ diameter object. Tie a double thickness of hair around the center. Glue the center to the center front of the doll head. Wrap the loops around the head to the back and glue in place. Glue two roses on the head opposite the bow. 12. Glue the dried flowers in the basket and glue the basket to the hand under the sleeve.